Isfahan or Sepahan (Persie: اصفهان‎ Esfahān), historically an aa rendered in Inglis as Ispahan or Hispahan, is a ceety locatit aboot 340 km sooth o Tehran an is the caipital o Isfahan Province an Iran's third lairgest ceety (efter Tehran an Mashhad). 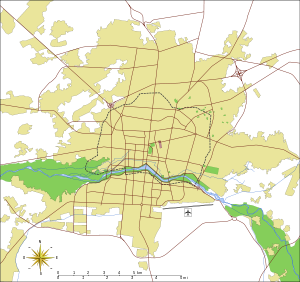 Isfahan ceety haed a population o 1,583,609 an the Isfahan metropolitan aurie haed a population o 3,430,353 in the 2006 Census, the seicont maist populous metropolitan aurie in Iran efter Tehran. The ceeties o Najafabad, Si-deh (Homayounshahr (renamed Khomeinishahr syne 1981), Khan Isfahan, Shahin-shahr, Zarrinshahr, Mobarakeh, Falavarjan an Fouladshahr aw constitute the metropolitan ceety o Isfahan. Isfahan is locatit on the main north-sooth an east-wast routes crossin Iran, an wis ance ane o the lairgest ceeties in the warld. It flourished frae 1050 tae 1722, parteecularly in the 16t century unner the Safavid dynasty, when it became the caipital o Persie for the seicont time in its history. Even the day, the ceety retains muckle o its past glory. It is famous for its Islamic architecture, wi mony bonnie boulevards, covered brigs, pailaces, mosques, an minarets. This led tae the Persian proverb "'Esfahān nesf-e jahān ast" (Isfahan is hauf o the warld). The Naghsh-e Jahan Square in Isfahan is ane o the biggest ceety squares in the warld an an ootstaundin ensaumple o Iranian an Islamic architecture. It haes been designatit bi UNESCO as a Warld Heritage Site. The ceety an aa haes a wide variety o historic monuments. ↑ "Sisterhoods". Isfahan Islamic Council. 2005. Archived frae the oreeginal on 2007-10-12. Retrieved 2007-12-04. Wikimedia Commons haes media relatit tae Isfahan.